"LITERATURE OF THE WORLD REVOLUTION"
Long live the red cultural world front ! Become a writer of the world revolution ! International Union of Revolutionary Writers ! "International Union of Revolutionary Writers"
On April 6, 2013, the Comintern (SH) started its initiative for the re-foundation of the International Union of Revolutionary Writers which was founded in 1925 and dissolved in 1935. "To the Proletarian and Revolutionary Writers of All Countries", urging them to assist in the foundation of a red litarary international. By 1926 the office was in communication with a hundred representatives from all over the world and plans were underway for an international conference. The First International Conference of Proletarian and Revolutionary Writers took place in November 1927, and was attended by writers and artists from forteen countries who were in Moscow for the celebration of the tenth anniversary of the October Revolution. "Soviet literature and the proletarian literature in the capitalist countries develop under different conditions, and each one of them has its own distinct features. What is necessary is the struggle for the hegemony of revolutionary literature in every country. This struggle must be conducted in alliance with ... fellow-traveller. It is necessary to proceed immediately with the organizing of associations of proletarian and revolutionary writers in the capitalist countries." To assist in this effort, an International Bureau of Revolutionary Literature (IBRL) was set up. By the time the Second Conference of Proletarian and Revolutionary Writers took place in November 1930 in Charkov, there were writers' organisations in Germany, Hungary, Austria, Poland, Czechoslovakia, Japan, and the United States. Altogether, over a hundred delegates from twenty-three countries participated. 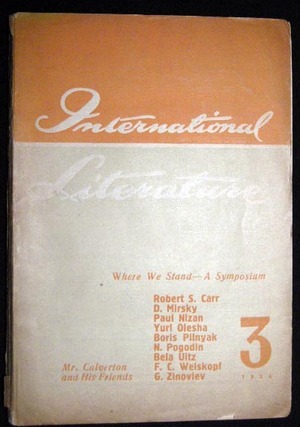 In the course of the conference, the IBRL was renamed the International Union of Revolutionary Writers ( I U R W ), and a twenty-five members executive council was elected. The new designation coincided with a change in character, in that the I U R W would be henceforth not a union of individuals, but of writers' organizations. Its task would be to coordinate the movement in the various countries, exchanging informations as well as literary and theoretical material. To this end the I U R W established as its official organ the magazine "Literature of the World Revolution", later called "International Literature", which appeared bimonthly in separate German, English, and French and Russian editions. At Charkov, Germany was described as the second most important center of proletarian culture alongside the Soviet Union. The fact that Germany had the largest Communist party in a capitalist country, as well as a long tradition of revolutionary workers' literature and theater, no doubt contributed to the rapid expansion of the movement there. The first initiative toward the creation of a proletarian-revolutionary writers' organization under Communist aispices came in 1927, when the Communist party (KPD) decided to create a "red cultural front" to counteract the bourgeois ideology in the field of culture. Toward the end of the same year four German Communist writers, including Johannes R. Becher, attended the First International Conference of Proletarian und Revolutionary Writers in Moscow. 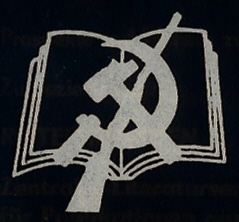 Shortly after their return home they began organizing a revolutionary writers' organization, and in October 1928 the BPRS ( "Bund Proletarischer Revolutionärer Schriftsteller" ) was founded. The organizational statutes of the BPRS stated that it accepted professional or semi-professional writers as well as worker-correspondents. Although membership in the KPD was not required, there was no doubt about the organization's allegiances. 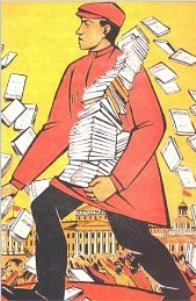 A program of action, drawn up by the founders, included among its points the defense of the Soviet Union, and, in keeping with the politics of the "Third Period", called on its members to use their literature as a weapon in preparing for the immanent collapse of capitalism and for the approaching world revolution. The work of the IURW was conducted through national sections and groups, and among its prominent members were L. Aragon, J. Becher, T. Dreiser, H. Barbusse, and B. Brecht. In 1935 the IURW was dissolved in the course of the opportunist turn of the VII. World Congress of the Comintern. Criticism on this wrong, liquidatory decision of the VII. World Congress means nothing but to re-found the I U R W ! the heart and brain of the world proletariat and the broad working masses for the socialist world revolution. " Central Organ of the International Union of Revolutionary Writers. From: 'Literature of the World Revolution' No. 3, 1931, Central Organ of the International Union of Revolutionary Writers, State Publishing House, Moscow. "Man's dearest possession is life. It is given to him but once, and he must live it so as to feel no torturing regrets for wasted years, never know the burning shame of a mean and petty past; so live that, dying he might say: all my life, all my strength were given to the finest cause in all the world- the fight for the Liberation of Mankind."